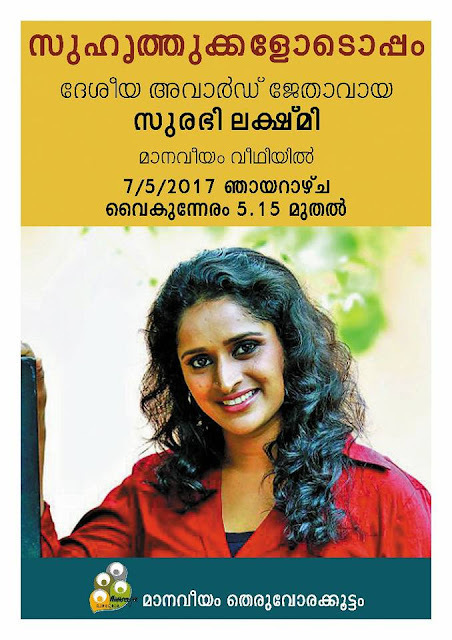 Trivandrum, 7 May 2017: Surabhi Lakshmi winner of National Award for Best Actress will be honoured by Manaveeyam Theruvorakkoottam at Manaveeyam Veedhi, Vellayambalam today. Surabhi will be felicitated by group of friends and Trivandrum film fraternity at 5.15 pm today. The event will be followed by a drama show.